Our Amalfi Coast tour to of Positano, Amalfi and Ravello Include: Services of your private tour guide, luxury vehicle transportation. Departure Points: Naples, Sorrento areas. Other departure points available. One of the most memorable day tours in Italy is our private Amalfi Coast tour. This private Amalfi Coast tour to Positano, Amalfi and Ravello offers breathtaking views and relaxing walks along the elegant streets of these three world-famous holiday seaside resorts, rich in history, fashion and spectacular views. 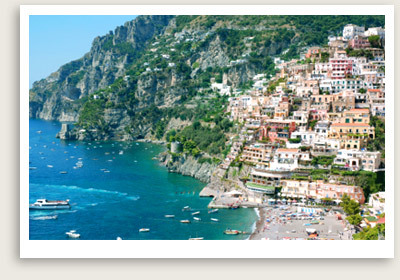 This private Amalfi Coast tour will start in Positano. The laid-back town of Positano offers many photo and shopping opportunities, between its multi-colored houses clinging to the cliff face overlooking the bay, and the fashionable boutiques and cobblers’ shops along its pedestrian main street. Your next stop in this private tour is Amalfi, a UNESCO World Heritage site featuring the St. Andrea’s Cathedral, whose 57 steps will reward you with a great workout and a great view. The city is also home to the Museo della Carta, which introduces you to the art of paper making for which Amalfi is known. The last stop on this private Amalfi Coast tour is breathtaking Ravello, which has long been a retreat for artists and writers seeking their muse here, from Richard Wagner to Virginia Woolf. You will be blown away by the beautiful Villas Rufolo and Cimbrone here, with their gardens towering above the sea from an impressive height.